Formal or casual, reserved for special occasions or used daily, a dining room can be versatile. “The way to determine the look is to start by considering the best way to use space in your room and whether or not it is to be open plan or another room entirely,” said Achille Salvagni, an architect and designer based in Rome, Italy. “A dining room should have warm colors on the wall, such as a rich, deep rust or a beautiful dark green or blue. My preference is earth tones, like deep orange or deep red, as they are the most inviting. “In a classic dining room, it’s best to place the table in the center of the room. However, if you decide to create an open-plan living space and include a living room, set the sofas and chairs first and then the dining room table usually gets placed in a corner. You might opt for a circular table, which is inviting and can be taken out as needed or stretched out into the space, or an oval or rectangular style with leaves to extend as needed. When placed in a corner, the table can be stacked with books, a big lamp, plants, or flowers and it will look very charming. 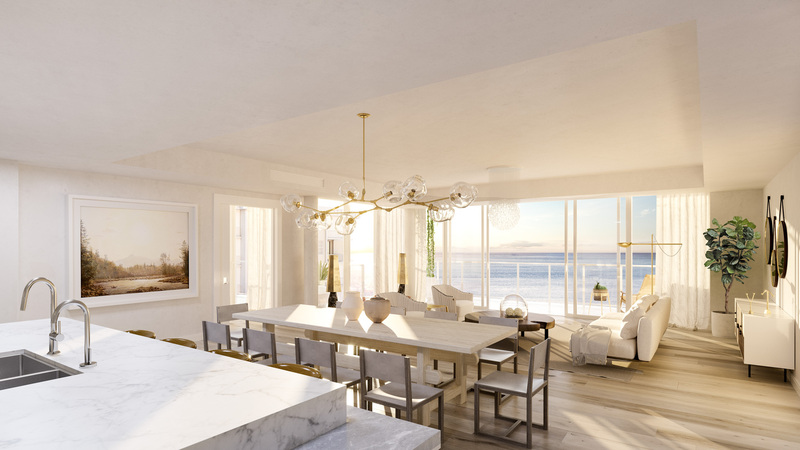 In this open-plan living-dining room, designed by Alexandra Champalimaud for 3550 South Ocean in Palm Beach, Florida, the dining room is demarcated by a statement light fixture and window treatments are minimal to maximize the water views. “Window treatments can be minimal, especially when the windows themselves are beautiful and the view is beautiful. Otherwise, incredible curtains that come from the ceiling and break on the floor bring interest and drama to a room. The color should contrast with the walls or a great rich pattern with tonalities. I also love to see a lot of wood — wood rods are a beautiful choice.